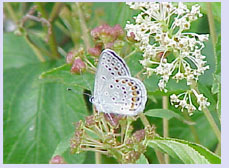 One species of Blue butterfly named by Vladimir Nabokov--the "Karner Blue" or Lycaeides melissa samuelis Nabokov 1944--was among the first animal species placed on the United States' Endangered Species List. Its legal status as "endangered" resulted from years of rigorous research coordinated by the United States Fish and Wildlife Service with various scientists specializing in Lepidoptera (moths and butterflies). The original distribution of the Karner Blue was across scattered pine savannah habitats in northeastern North America. There is still some question concerning whether the Karner Blue is a full species or an isolated eastern population of the more widespread Melissa Blue of western North America. For the purposes of the Endangered Species Act, however, the population named "samuelis" by Nabokov in 1944 is considered biologically unique and therefore worthy of legal protection by the United States government. What is an "endangered species"? The tests that are applied for listing a species as "endangered" in the United States under the Endangered Species Act (1973) provide a legally accepted definition. However, as conservationists point out, there are no laws in the United States to protect endangered habitats. As a result, when it comes to protecting the habitats of endangered species, all conservationists have to work with are the laws (and their resulting "leverage") which protect individual species on the national list. Since nearly all scientists believe that loss of habitat is the chief cause of species loss (habitats are communities, not individuals), present laws in this country aimed at protecting endangered species are a bit of a conundrum. What about Nabokov's "endangered species" in South America? Here, only the subjective criteria of scientists have been applied to date and, although several species of Nabokov's Blues were clearly portrayed as endangered in the book Nabokov's Blues, the first published details of the threatened situations of seven species of Nabokov's Blues in South America were not published until late 1999 (September issue of Lepidoptera News, published by the Association for Tropical Lepidoptera). This issue was mailed in December 1999, so much of the information is very new. The Lepidoptera News article, written by this author, relied heavily on detailed reports and rearing and habitat research on these Blues provided by Israel's Dubi Benyamini. For purposes of the article, species were considered "endangered" when 1) they had been documented as extirpated at the locality from which they were originally named (as well as similar habitats known to lepidopterists active in the region) or 2) they are species known only from old museum specimens (in most cases decades old) and recent, diligent and long term, searches for the species at appropriate localities have ended in failure. Presently, there is no legislation in place in areas of the Andes or southern cone of South America to officially (that is, legally) declare butterfly species "endangered." Thus, the listings cited here merely reflect a "red flagging" by scientists currently studying the insects.